ISIS is now engaging in a heinous, barbarous act–one which Muslims have long falsely accused Jews of doing: harvesting the organs of Muslims. And it’s safe to say, those Muslims’ organs are harvested by force. It’s also likely safe to say, given that ISIS beheads and burns its victims alive, that this barbarism is probably done without any sort of anesthesia. That’s probably why some brave, ethical Muslim doctors who refused to engage in this practice are also dead. They had to know that refusing ISIS means certain death. In real life, it is MUSLIMS in ISIS who are harvesting fellow Muslims’ organs by force and murdering them. But, hey, because it’s not Jews or Americans doing it, there are no Turkish TV movie and blood-libel stories circulating around the Muslim world, as there were (and still are) about the Jews. 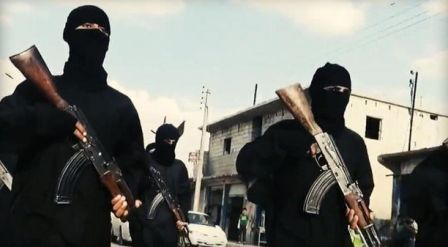 Iraq’s ambassador to the United Nations asked the U.N. Security Council on Tuesday to look at allegations that the Islamic State of Iraq and Syria (ISIS) is using organ harvesting as a way to finance its operations. Ambassador Mohamed Alhakim told reporters that in the past few weeks, bodies with surgical incisions and missing kidneys or other body parts have been found in shallow mass graves. “We have bodies. Come and examine them,” he said. “It is clear they are missing certain parts.” He also said a dozen doctors have been “executed” in Mosul for refusing to participate in organ harvesting. Alhakim briefed the council on the overall situation in Iraq and accused ISIS of “crimes of genocide” in targeting certain ethnic groups. The outgoing U.N. envoy to Iraq, Nikolay Mladenov, told the council that 790 people were killed in January alone by terrorism and armed conflict. Mladenov noted the increasing number of reports and allegations that ISIS is using organ harvesting as a financing method, but he said only that “it’s very clear that the tactics ISIL is using expand by the day.” He used an alternative acronym for the group. Um, yeah, that acronym, ISIS, which the mainstream media seem universally to refuse to use, is the one we should use. ISIL, which includes, “the Levant,” is a reference that all of the Middle East, including Israel, is Muslim land. That the media prefers ISIL says a lot about its agenda. That CBS won’t even mention the “alternative acronym,” ISIS, used by the U.N. official, is very sad and certainly not accurate reporting and legit journalism. In any event, Muslims have never apologized for their long-used canards and blood libels against Jews. Now that ISIS is actually doing what they falsely accused Jews of doing, where is the outcry? Mostly crickets chirping, per usual, because Jews aren’t involved. Thanks for the link to your father’s article!!! Yes, Debbie, that was excellent! The accusations that the Jews were ever harvesting the organs of Muslims is absurd. First of all, no Jew would transplant a Muslim organ into another Jew. Secondly, Muslim organs would never function properly in a human body. Maybe a dog or pig, but not a human. I believe that Mr. Adamo recently gave a percentage of the world’s population that is Jewish. If the figure he stated is correct, that would mean less than one out of every 500 people on earth. I was just having a conversation with a cousin in Puerto Rico, who was born in late 1941. The call dropped after about 15-20 minutes, and I could not get her back, as there are problems all over PR regarding phone lines. She is horrified about all the news she is seeing about the worldwide outcry against Jews. My cousin remembers meeting and knowing Jewish people who were taken in by families in Puerto Rico during the 30’s and 40’s who had their names changed. Not all were taken in as children. She remembers full well as a child hearing the news of Hitler and WWII. This is a brilliant woman who has some incredibly cognitive memories of a very young age, so she can actually remember things about the period of WWII. She had her IQ tested in the top 1% when she was young. When I added to the list of things she’s already heard, the story about the desecration of graves at a Jewish cemetery in France last week, she was speechless. This is a woman who can well remember Jews being scapegoated throughout the world during her own lifetime, and now she’s seeing it again. She and many others from my Puerto Rican side of the family came to NYC during the 50’s and 60’s. They worked for many Jewish people, doctors, lawyers, store owners, executives, name the field. They developed strong relationships with the Jews they worked for and knew as neighbors. What is happening in the world now is shocking to them, as they thought the human race had progressed past such sickness. There are a few people left in my family, a couple close to me, and many distant cousins, who can remember the WWII era. But some day soon just about everyone who knew that era will be dead. And we will be faced with WWIII, which perhaps has really already started, and people who don’t know and don’t care about learning from history. It’s a history the young folk among us sadly never bothered to learn enough about, so as not to engage in it again. Before this cousin of mine and I got cut off a little while ago, I had made the analogy of the human race being like a psychologically conflicted person. I also mentioned the dog that won’t stop chasing its tail. She agreed with both. She’s horrified. If an old woman in Puerto Rico who can no longer walk can see it, despite the heavy left wing leanings of much of the news media down there, then it’s no secret anymore. And anyone who can’t see it, is still part of the problem. The word is out, it’s all over the world, it’s in the open. It’s okay to hate and exterminate the Jews, because they’re the real problem. If we can finally get that done, we can all join hands, teach the world to sing, and buy the world a Coke. God help us all. PLEASE!!! Small point: The only name that people should use for the Islamic State is the Islamic State. No Daesh, no IS, no ISIS, no ISIL. The Islamic State. It gets the point across. It is the only term I use for these cretins. We didn’t call the Khmer Rouge the KR or the Taliban the T or Al Qaeda AQ. VC was used for Viet Cong but that was more slang and not used in articles that I’m aware of. Our ignorant Islamo-pandering President or Islamic State Caliph Al-Baghadadi who holds a Ph.D in Islamic Studies and is well versed in the Koran, the Sunnah, the Hadiths and Islamic Laws? People who deny the fanaticism and cruelty of Islam don’t know the hell what they’re talking about. Since if Islam is being perverted as our Prez claims, who is perverting it? Yup, Islam contributed Enlightenment, democracy, the rule of law, the right to vote, women’s lib and all those wonderful things to the fabric of our country. Along with tolerance and religious freedom. All According to the World Of Obama. “That’s probably why some brave, ethical Muslim doctors who refused to engage in this practice are also dead” I never imaged you would use the words ” brave and Muslim” in the same sentence. I thought 1.6 billion Muslims are evil and bad? Even a broken clock can be right twice a day. Since brave and courageous Muslims usually get branded un-Islamic and wind up in bad situations I’ll take the Muslim world and agree that they are. That’ll do them much more good than branding them moderates. I guess they are harvesting organs because they are out of work. Hopefully we can supply them with enough foreign aid so they will stop doing this. I guess it is tough when you are out of work. When my husband took medical ethics a couple years ago, he did a presentation on trafficking of human organs. Prior to that I had no idea it was so widespread; and done to people without their consent. There is a lot of evidence out there but it doesn’t get much attention. Donna, is that your considered intellectual response? How is responding like an immature fourteen year old to a serious issue intelligent? originates with the administration and the White House. Says a lot about their agenda. Yeah, it does. The number one issue is what you won’t look at it. It’s probably a lot of Chinese and Russians driving the black market for organs. cookiebot, I agree w/ you – I too just call them what they call themselves – Islamic State. Also, the ‘caliphate’ label is not inaccurate – they have supporters all over the world – it’s not restricted to Iraq or Syria. The other thing – what they do today is what the actual caliphates did following the Arab conquests of the 7th century and beyond. Mohammed would be proud of them, except maybe for the fact that they are local Arabs and not the chosen Arabs of his own Quraish tribe. Also, they ain’t much different from Hamas, Hizbullah, al Qaeda, Taliban, Lakhkar e Toiba, Jemimah Islamiah, Abu Sayyaf, et al. Only that those other groups are careful enough not to broadcast their activities worldwide. Also, it’s interesting how people seem to have forgotten that al Qaeda is a terrorist organization, even though they’ve killed far more Americans than the Islamic State has.